All of these students are now eligible to compete for a spot in NATS National Semi-Finals for musical theater. This entry was posted in alumni students faculty NEWS and tagged NATS on March 23, 2018 by Thomas S. Clark. Jenna Quiroz won first place in the Southwest region conference of the American Choral Directors Association undergraduate conducting competition. This entry was posted in alumni students faculty NEWS and tagged SWACDA on March 19, 2018 by Thomas S. Clark. Michael Martinez (MM ’17) recently won 1st prize in the American Trombone Workshop’s National Tenor Trombone Solo Competition in the 3rd division. Martinez is a first-year DMA student at the Eastman School of Music. This entry was posted in alumni students faculty NEWS on March 19, 2018 by Thomas S. Clark. Dr. Martin McCain recently performed with the IRIS Orchestra conducted by Michael Stern at the IRIS Orchestra Gala. Joshua Bell performed 3 concerti for violin and orchestra. 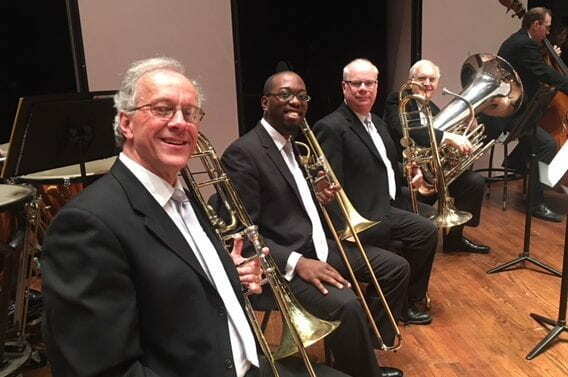 McCain also performed as guest 2nd trombone with the Memphis Symphony Orchestra where he sat in between two of his former teachers in a performance of Tchaikovsky’s 5th Symphony. On March 1st he led a brass masterclass at Buffalo State University. McCain hosted Italian trombonist Peter Steiner February 18-19 and the Pickett Blackburn company on March 6. He also received a favorable review of his latest CD, “Trombone Czar: The Extended Version” in the international Brass Herald journal. This entry was posted in alumni students faculty NEWS and tagged IRIS Orchestra on March 19, 2018 by Thomas S. Clark.